Preheat oven to 350, Rub down a 13x9 pan with butter. Sift the flour, baking powder and salt in a small bowl. Set aside. Next is separating your egg whites from the egg yokes. Once as you have them separated put the egg whites in the bowl of your stand mixer. Beat on high for 1-2 1/2 minutes, or until you reach medium to stiff peaks, then add the 1/4 cup of sugar and mix on low. Once as stiff peaks have been achieved, move egg white to a separate bowl and set aside. Next, take the egg yokes and 3/4 cup of sugar and put in the bowl of your stand mixer. Beat on med-high/high until pale yellow and falls back on itself in a ribbon like manner (like in the picture), about 5 mins. Once as it has reached this thick stage, add the milk and 1 teaspoon of vanilla and mix of medium. Then slowly stir in the flour mixture; then add in the egg whites. Be sure to carefully fold in the eggs white so as not to take away all the air bubbles from the whites. Now time to pour in the pan! Bake in a 350 oven for approx. 30-40 minutes. The cake may seem a little darker than a yellow or white cake but thats ok; It is going to get soaked with milk. You don't want it to be too soft, or else it cant soak up all the milky goodness! Once as the cake is done baking and has cooled, poke all over with a fork or toothpicks. This is creating passage ways for the milk to soak into. Combine the sweetened condensed milk, 3 tbs of the heavy cream, 1 teaspoon of vanilla and the evaporated milk (all of the can but 1/2 cup of it-if you use it all it gets a little too mushy esp. for my liking). Slowly pour the milk mixture all over the cake. Try to make it as even as possible. While the cake is soaking make the whipped cream! Make sure the remaining pint (one pint - the 3 tbs in the soaking liquid) of whipped cream is very cold. Pour it into your stand mixer and beat with whisk attachment on high for 1 1/2 mins. Add in the last 1 teaspoon of vanilla, almond extract and powdered sugar. 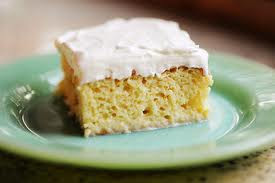 (Depending on how sweet you like things, you may want to add more or less sugar to the whipped cream) Continue to beat on med-high until think. Spread on the cake and stick in the fridge to chill. Chill for at least an hour, but over night would be even better so the cake has the opportunity to soak up all of the milk!